Growing up in a fairly affluent family allowed Frank Stella to attend a prestigious private school in New England, the Phillips Academy, where they had a small art gallery with some 19th century art as well as artists like Hans Hoffman and Josef Albers. Stella said Hoffman and Albers were his biggest influences early on. In 1954 he entered Princeton University, majoring in history, however he also began to paint. For years he had painted houses and boats, initially at his father’s insistence. When he moved to New York, Stella was still painting houses to pay rent, and continued to use the house painter’s brush and enamel when making his Black Paintings (1958-60). 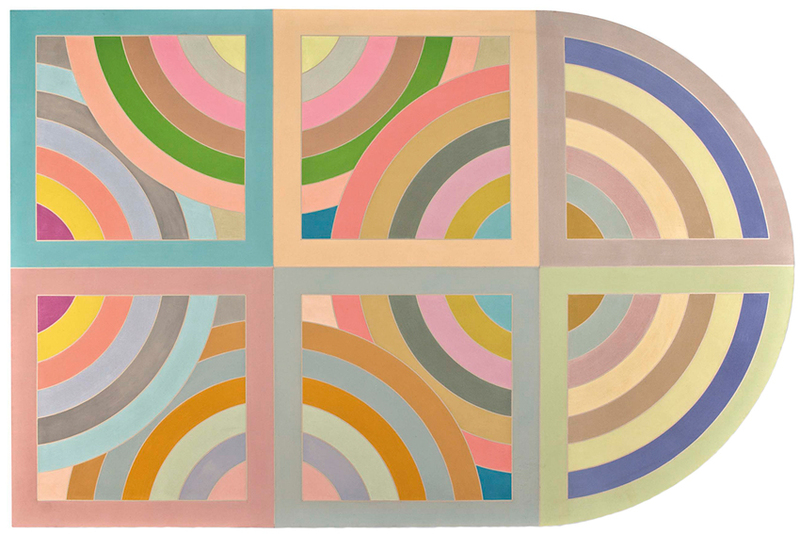 Since his early, flat geometric works, his style has constantly evolved. The controlled minimalism of his 1950s and 1960s works led to large works in brighter colors and then evolved further to become sculptural, comprising house and car paint, cast aluminum, fiberglass and later he employed 3D-printing techniques. Once living in New York city, Stella encountered the work of Abstract Expressionists including Jackson Pollock and Franz Kline. He was quoted as saying, “I wouldn’t have bothered becoming an artist if I didn’t like the artists of that generation so much.” But it was Jasper Johns whose flag paintings propelled him on his path to begin using stripes as a compositional unifier. His work was featured in an exhibition at the Museum Of Modern Art before he was 25 and he had his first retrospective at the museum when he was just 34. Recently, the new Whitney Museum of American Art opened with another retrospective in October 2015. We can be in awe of how astonishing Stella’s career has been, by looking at his fifty-seven different series over sixty years. His goal, he stated, was to imbue abstract art with the depth and density of old master paintings. He has indeed reached his goal to have geometry tell a story and his work has a narrative impact, telling us every day that he has pushed boundaries and pushed himself to take on amazing challenges. He is now the major influencer of an entire generation of artists.